This is a review for iDrive, which is an online backup firm. They have been in business since 1995, and when they first started out they catered to large businesses, like fortune 500 companies. In an effort to expand their market share, they have been reaching out to individuals and small businesses recently. They are attempting to be able to provide them the same excellent backup services, that they supply the mega size corporations. This is not an easy task for many reasons, and in our review of them below, we will let you know how they are doing. Most large corporations have IT departments run by computer experts. Whereas most small businesses and individuals, usually do not possess nearly the expertise that you would find in a typical high level IT department. In order for the online backup company iDrive to survive and thrive in this market, they are going to need to simplify their software, and greatly increase the capabilities of their customer service department. During their time in business, they have won a few awards, some of which are the following; PC World Editor’s choice for best online backup service (2006), PC Magazine Editors Choice (2004), and they were runner-up for the same award in both 2003 and 2005.
iDrive provides a good feature set with great security features. iDrive provides a healthy amount of storage for a very reasonable rate. iDrive doesn’t provide support for the Linux operating system. No user discussion forum for their users to discuss features, issues, etc. The first thing that you are going to notice when you start to look over their pricing plans, is that they offer up to 5GB of backup space for FREE. Whether you take advantage of this offer or not, please do not be surprised if at sometime in the future, that this free option, does not become a paid subscription. The rest of their packages are based on the amount of storage space that you require. Their personal package is priced at $4.95 a month, or $49.50 a year if you pay it all at once, and you can get 150GB of storage capacity. They have what they call a “Family Plan” that allows you to backup 5 computers and use 500GB of space. It runs $14.95 a month, or $149.50 per year, if you pay it all up front. Their business plans start with 50GB of space, which will run you $9.95 a month, or $99.95 a year if you pay it all in advance. The next level is 100GB of capacity, which cost $19.95 a month, or $199.95 on a yearly basis, if you pay it all at one time. The next jump up is to 500GB of space, and it cost $49.95 a month, or $499.95 per year if you pay it all at one time. Their last level provides you 1,000GB of capacity, and it runs $79.95 a month, or $799.95 if you were to pay it all off when you first signup. Just by examining their pricing plans, it is easy to tell that this company is still not fully committed to supplying the individual and small business the service that they require. That being said, let’s see how they do in the rest of our review. The online backup company iDrive telephone support department is open Monday thru Friday, from 6AM to 6PM Pacific Standard Time. As with all of our reviews, we always call the customer service department and ask them a few very difficult questions. The problem we were facing here; is that iDrive is such an advanced company in this industry, we did not think we could come up with anything that could stump them, and we were right. Over the many years that we have been reviewing almost every type of firm that operates on the World Wide Web, we found it very difficult to remember when we had a better experience using a customer service department, iDrive’s was that good. If an outstanding customer service department is high on your priority list when it comes to selecting an online backup firm, it is virtually impossible to find one too much better than iDrives. We were really worried about this part of our review for the online backup company iDrive. Since they are used to working with large corporations, we thought their software would be extremely complex to get installed and working correctly. While we did have a few issues getting it running properly, most of it was our fault by the way, because as usual, we really did not read the tutorials as well as we should have. After we made a phone call to one of the best customer service departments you are ever going to find, we quickly realized what we were doing wrong, and everything went great after that. 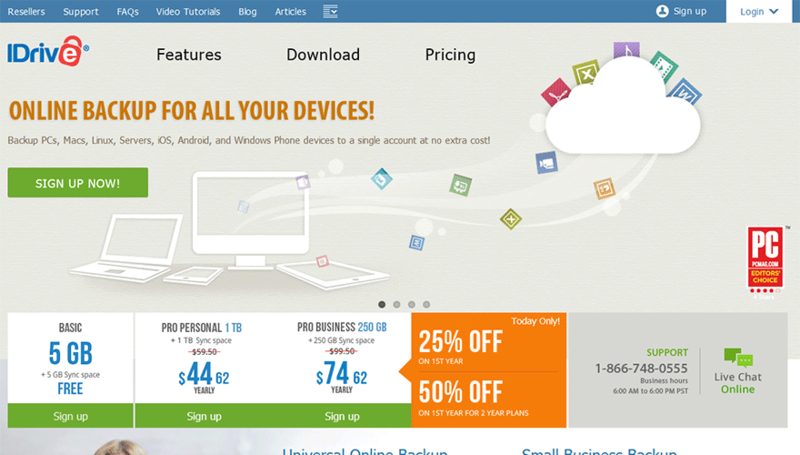 Most if not all online backup companies do very well in this portion of our reviews for them. After all, if they did not, they would not be in business too long. That being said, iDrive takes security to a completely different level. After attempting to discuss their security features with one of their customer services representatives for only a few minutes, we just gave up and moved on to something else. They were running down everything that they do, and mentioned a few systems that we had not even read about previously. Needless to say, your data could not possibly be in safer hands, than it will be with iDrive. You can use both Mac and Windows computers with their system. But, they have not yet starting supporting mobile devices like the smart phones or the iPad. Most online backup firms will allow you to store all legal files on their servers, and iDrive is no different. You can save text, videos, music, email, software, or whatever else you need to backup on iDrive’s servers. Our final rating for this review of the online backup company iDrive is excellent, as you should have expected. The only negative that we could possibly come up with, is that we wished that they provided more pricing flexibility for small businesses and individuals that want to use their service.